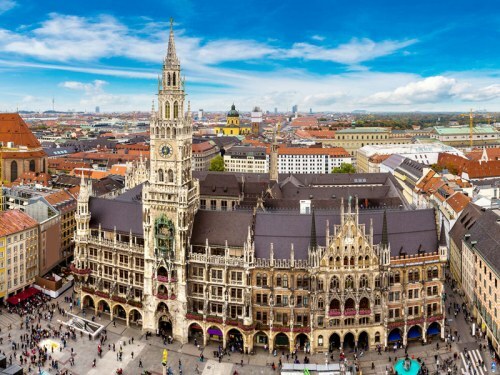 There are currently some roundtrip flights available from Seattle to Munich, Germany for as low as $512 CAD roundtrip including taxes. The flights are with Lufthansa, a very good airline. You would need to fly with carry-on only, because on the way home checked luggage would be checked through all the way to Seattle. Update: As Foster in the comments section kindly pointed out, passengers need to collect their luggage when they connect at YVR, so you would actually be able to fly with checked luggage in both directions. Also, some of the booking sites showing the lowest of these prices are not ones that I would normally recommend (such as Payless Flights or TravelMerry). You may notice that some of these flights that start in Seattle, also connect in Vancouver on their way to Frankfurt. This leads many people to wonder 'Couldn't I just hop on in Vancouver?'. Unfortunately the answer is no, all airlines will automatically cancel the remainder of your ticket once a portion of it is intentionally missed. Which is why you can only ditch out on the way home. 1. Go to Momondo or Kayak U.S.
Apr 18, 19 to May 1, 2, 3, 4 -- $590 CAD roundtrip with Lufthansa, try Kayak. Or $481 CAD roundtrip with United / Air Canada, try Momondo to TravelMerry. Apr 24, 25, or 26 to May 3, 4, 5, 6 -- $590 CAD roundtrip with Lufthansa, try Kayak. Or $481 CAD roundtrip with United / Air Canada, try Momondo to TravelMerry. Apr 27 to May 4, 5, 6 -- $590 CAD roundtrip with Lufthansa, try Kayak. Or $481 CAD roundtrip with United / Air Canada, try Momondo to TravelMerry. ^^ You may also see it come up with TravelMerry for $465 CAD. I do have my doubts about whether they can actually get these tickets issued before the prices change. Apr 30 to May 10 - $473 CAD roundrip, Momondo to TravelMerry - these ones are with United and Air Canada. Tip: Try clicking on 'Lufthansa only' on the left hand side of Kayak. Note: When you get to the Lufthansa website, the prices are in $USD. vancouver, yvr, flight deals, seattle, sea, europe, germany, central europe, western europe, munich, muc and lufthansa. 10 Responses to "Seattle to Munich, Germany and then non-stop from Munich to Vancouver - $512 to $588 CAD roundtrip including taxes"
I see this deal for march dates online but receive an error msg when I try and book. Is the deal over? On which site are you getting the error message? I'm still seeing them verify for April/May dates when going from Momondo to TravelMerry. And from Kayak to various booking sites. I didn't see any March dates where the flights home connected through Vancouver. It always seemed to be Chicago or Washington DC. Tried getting flight centre to book it for me but the flught wasnt coming up at the price i saw. So used the site Momondo took me to but error msg saying i took too long. Tried various other flight options, one was direct from seattle...but no success. Thanks as always for finding some amazing deals. I noticed on this one that you mentioned that you mention the need for carry on only on the return flight. However, doesn't YVR have a policy that you need to collect ALL your luggage and clear customs before any connecting flight? IE, then wouldn't you be able to get checked luggage and hop off on the YVR leg? Great point, thanks Foster! I will update the post. "Most passengers will have their luggage checked-through to their final destination, so you will not claim your checked-bags at YVR." However, right above this it states, "If you are making a USA to USA connection, you MUST pick up your bags and clear Customs." Do you have any clarification on whether or not you'd be able to pick up your bag coming in from Munich and depart the airport instead of carrying on to Seattle? hopefully no one gets sewered by this bad advice! Excellent summary of Augie’s own post. My own thinking has come down to the fact that social media is a valuable tool to discover what people say about you NOT what you want to say to people. Marketers don’t think that way so there is the disconnect. Even as a customer service tool, it is a better tool to vent anger than get meaningful help.